Dawoud Al Hajiri, Assistant Director General of Dubai Municipality for Engineering and Planning Sector, and Mohammed Mubarak Al Mutaiwei, Assistant Director General for the Communication and Community Sector, have inspected the Dubai Safari project, which is being established by the municipality in Al Warqaa-5. The visit was aimed at reviewing the progress of work and finishing touches that are going on. The top officials of the municipality were briefed on the different aspects of the progress of the project, which is nearing completion in the next few months. 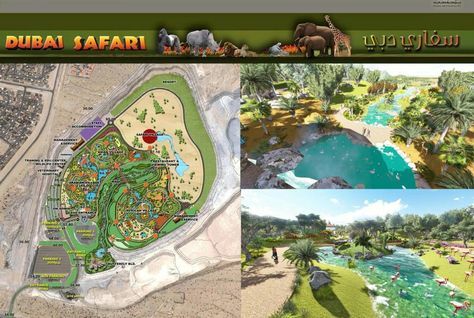 Dubai Safari is a unique project that the municipality is keen to develop in an environment-friendly manner with a variety of facilities. The Dubai Safari is spread over 119 hectares, of which 80 are dedicated for the villages representing different regions of the world and 35 for the Open Safari village. The project aims to re-create the best habitat for the wildlife in the world, providing different environments that suit various animals. It is also aimed at attracting visitors from various parts of the world, using modern interactive methods for viewing and movement to ensure a unique experience for visitors. While ensuring that the entertainment elements are in place, all safety requirements in accordance with international standards have also been taken into account. The project consists of a number of key villages: the Asian village, African village and the Open Safari Village, in addition to a Valley and Children’s Park. Each section of the park is built on the authentic environment of its character in terms of facilities, restaurants, umbrellas and animal shelters, so that it characterises the diversity of population and the different environments, providing fun and change throughout the course of the visitors. The Valley, supported by solar-power, has been set up at an area of 7.5 hectares, which includes a waterfall, a stream and a lake for fish, in addition to wooden bridges to connect the two sides of the Valley. The work of the Open Safari has already been completed on an area of 22 hectares and is on the pattern of Safari Gardens, so that they have large open spaces. The movement of visitors will be through environment-friendly electric vehicles. There are many special elements of suspense and excitement as well as opportunity to closely interact with the animals. Marwan Abdulla, Director of General Projects Department, Khalid Badri, Director of Corporate Marketing and Relations Department, and a number of officials and engineers representing the company executing the project, were also present on the occasion.